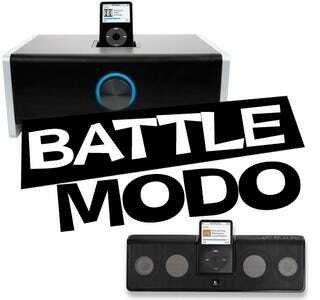 It's time for the $150 battle in our running iPod Dock Bracket. In one corner, we have the Logitech mm50. It's sleek and has excellent posture. We're guessing its grammar is pretty good, too. In the other corner, we have the alleged steroid-pumping Griffin Amplifi. Raised on the streets, the Amplifi showed up with a grudge. And right about now, the mm50 is wishing that it were matched by weight instead of price. If we were betting men, we'd give this round to the Amplifi. Why? Because we sorta know the reviewer. The mm50 is a nice piece of eye candy. You don't get the entire effect in press shots, but it's very thin and sits at an angle that, at first, seems impossible given the laws of gravity. Cool stuff. The Amplifi's design is the antithesis of the mm50. Instead of diagonal flourish, the Amplifi has a functional box structure. But it's well-constructed out of matte-finished wood. And it includes a large volume wheel that clicks when rotated, just like your heavy-duty receiver. Neither dock has any additional functions, though it's worth mentioning that both docks have line-in. The mm50 features a 3D stereo button. Yes, it sounds like a gimmick (no pun intended). But when listening head-on, the sound field does grow. It's just too bad this effect doesn't transcend to other listening angles. Plus, there is a lithium ion in this badboy, rated for 10 hours of use. The Amplifi comes with world plug adapters...we're guessing for production issues rather than portability...as well as the most iPod adapters we've seen with any unit yet. It's literally compatible with all models of iPod. We started our testing with Aimee by Pure Prairie League. The mm50 was has a reasonable mid to high range, with guitars coming through with presence, be it slightly metallic. Given the thin form factor, performance was within our quality standards. But we wished the mm50 took a lesson from it's younger brother, the Audiostation Express, and added an acoustic chamber for some resonance—since engineers could probably add one without changing the system's footprint. But the Griffin has no limitations of form, and easily featured the best bass of any model tested yet. I mean, that should be the case, considering the unit's size. But there's a pleasant thump and a really strong midrange going on through the song. Vocals occasionally approach brilliance, though fidelity is lost on the highest-end sounds (stuff like chimes, etc). Testing multiple genres, especially with R&B, the Griffin was consistently the more balanced sound. The mm50 sounds good and looks even better. But while finishing this review, it was the Amplifi that we chose to play in the background. Ultimately, the Amplifi's sound is good enough to overlook the unapologetic size difference. Though given that both models sell for well under their $150 retail, we can't say that you're going wrong either way.